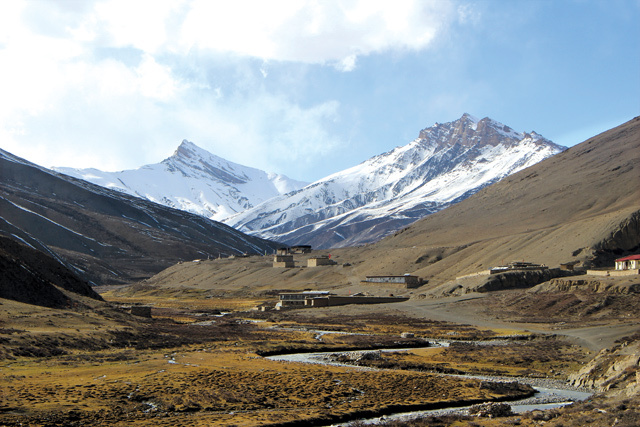 SCHOOLED IN NATURE: The dramatic scenery surrounding Crystal Mountain School in Dho Tarap of Dolpo belies the lack of care for education in this remote and road-less district. More than other groups in Nepal’s diverse ethnic fabric, the mountain communities of Upper Mustang and Dolpo are left out of the country’s social and political mainstream. 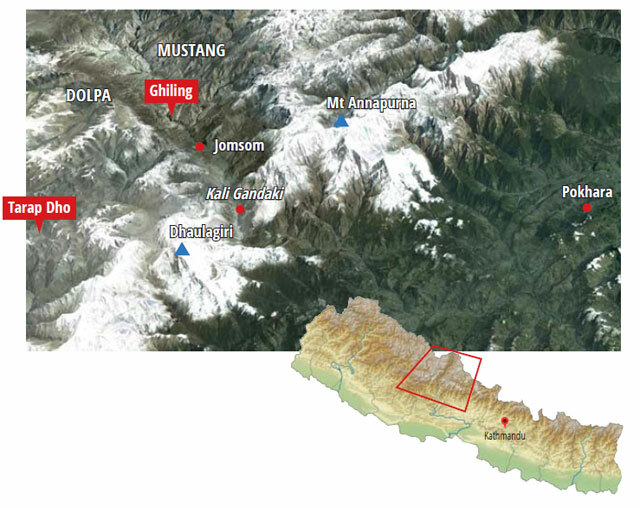 These high and arid regions in the Himalayan rain shadow have been isolated from the rest of Nepal not just due to their remoteness, but because of lack of investment in health and education by faraway Kathmandu, poor infrastructure, and restricted and expensive tourism. One of the most neglected among the neglected sectors is education. Schools here are run mostly by non-government groups, with minimal state involvement. Students do not get text books even by the end of the academic year, and those books first have to be bought by private groups and then carried by mules to remote villages. Apart from the romanticisation of their ‘exotic’ and ‘authentic’ Tibetan lifestyle and the potential for trans-Himalayan tourism, communities here are rarely represented in the Nepali national psyche. There is a high rate of out-migration to the cities and abroad, and villages have to rely mainly on private support for education, unlike other areas of Nepal. 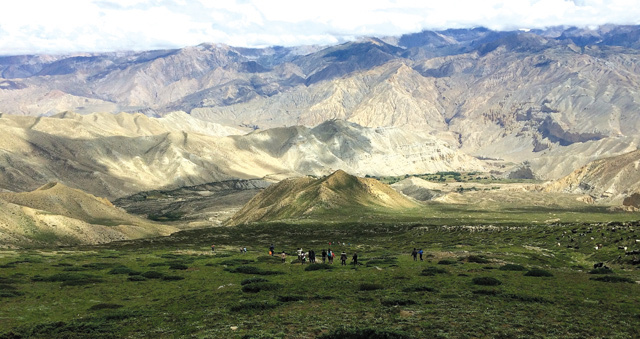 Since Upper Mustang and Dolpo have low population densities, the settlements are sparse and students have to travel long distances to reach school. Although the districts fall within Nepal’s boundaries topographically, they belong to the Tibetan plateau, with a harsh yet stunning landscape at an average altitude of 3,000m. Students of Jana Jyoti Community School in Ghiling on a hike above their village. The pan-Nepal problem of an overly standardised, often decontextualised and culturally mis-representative 10-year-old national curriculum is starker here than elsewhere. Poor school facilities and gaps in human resources exacerbate the problem. In Mustang and Dolpo, children four and older are lined up at school assembly every morning, where they do ‘hands-up’, ‘hands-down’, and ‘stand-at-ease’ in front of the principal without really understanding what they mean. The students are then made to sing the national anthem in a language they cannot yet speak. The need to control the students is evident in classrooms where children are lined up on uncomfortable benches to copy sentences from books in English, their third language. Most teachers are on contract, and unable to hold conversations in a language they are supposed to be teaching. Most cannot speak in the mother tongue of the students. Government teachers are largely unfamiliar with the curriculum, which was put together with European funding. They are unaware of learning objectives for each grade, and teach the way they were taught: reading from textbooks and privileging rote-learning and social conformity. They are unaware or incapable of using the curriculum to develop local content for regular subjects. The district school superintendent barely visits these remote, cold and barren areas. Not only is quality education lacking, but most students are not in age-appropriate classes and do not continue to higher education. To be sure, not all schools are doing poorly. Since they are supported by international charities, many are better than most public schools in rural Nepal. But they face problems of curriculum implementation and lack of teachers. Some schools focus on culturally meaningful education, including study of the Tibetan language, Buddhist philosophy and local histories, and graduates have gone on to become teachers, health assistants and skilled workers. 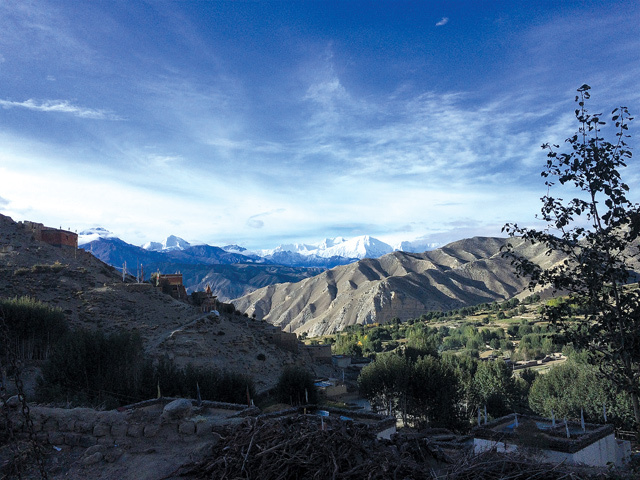 Although education has improved dramatically in the past two decades in both Upper Mustang and Dolpo, there is uncertainty about whether the schools can sustain themselves. Moreover, the current decontextualised education system is locally irrelevant, culturally misrepresentative, actively discourages independent thinking, and barely imparts necessary life skills. High mountain areas face specific challenges owing to their geography, climate, unique culture and customs. These districts are ‘Nepali’ when it comes to tourism promotion but are treated as ‘non-Nepali’ by the district authorities and teachers who cannot come to terms with communities that don’t fit their definition of what being Nepali means. Pawan Dhakal is a Dartmouth College Class of 2016 alum on a year-long Public Service Fellowship with two schools in Upper Mustang and Dolpo. This school sits in pleasant green surroundings on the main trail from Jomsom to Lo Manthang. It goes up to Grade 8 and serves about 100 children from the town and surrounding areas. Situated at 3,500m, it is supported by Maitri-Ratna, a Nepali NGO started by a former resident of Ghiling to boost the future of children in the region. Apart from teaching Tibetan language and Buddhist philosophy, the school runs an apple orchard and a greenhouse to help defray costs and make it less dependent on private donations. With a hostel housing 60 students, Jana Jyoti has earned a reputation throughout Mustang for its success rate in school-leaving exams. Two graduates are now government teachers at the school, one of whom is the head teacher. Another grad is working as a nurse at the school, and also serving the village’s health needs. The view (above) of Annapurna I and Thorung Peak from Ghiling School in Mustang looking south. 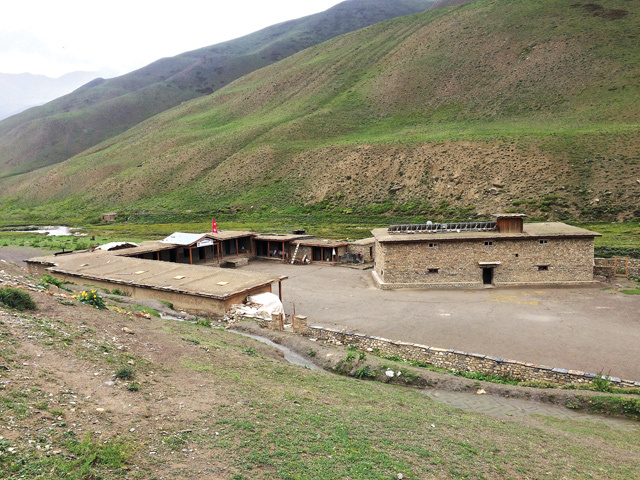 This school runs up to Grade 7 and is operated by Vision Dolpo in collaboration with Action Dolpo, a French NGO. It was the first school in this remote and road-less district and its reputation continues to grow. With 200 students from four surrounding communities, it is situated in the scenic 4,200m Dho Tarap Valley. Vision Dolpo also runs a local health post and the Snow Leopard Residence in Kathmandu, where students stay while attending Grades 8-12. The coordinator of Vision Dolpo and Crystal Mountain is one of the school’s first graduates. Other grads regularly volunteer at the school after their Grade 12 exams. The school has good facilities, including a passive solar house that allows local teachers to conduct classes even in the harsh winters here. King Gyanendra wants to be a pro-active monarch, and is trying to feel the nations pulse. On Saturday, when a new Kumari receives a new King, the Hanuman Dhoka Palace will see the enactment of a ritual that is as old as Nepal itself. 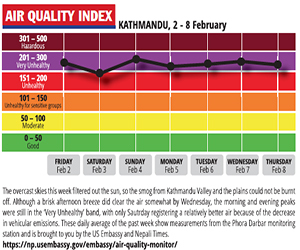 There may be some bullying through environmental "tools of diplomacy", but Nepal has a shot at avoiding developments "dirty" phase. Who’s playing by the rules? 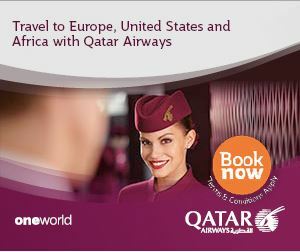 Who’s not?